A narrow needle-like island jutting up among the 42 limestone islands in the 400m² Phang Nga Bay is what tourists come to see. It is very small but due to the island’s notoriety, it is why tours of Phang Nga Bay are often called the James Bond Island tour. And whilst the island makes a great starting point for exploring the bay it is by no means the highlight. There is just so much to see during a Phang Nga Bay tour. Khao Lak is just over 80km from Phang Nga one of the 77 provinces of Thailand. So most tours begin early. Ours with Khao Lak Triple is no exception. At 7am a luxury air-conditioned van with mirrored ceilings and plush beige leather reclining seats collects ten of us from the Mai Khao Lak Resort and Spa for a full day tour of Phang Nga Bay. It takes an hour and a half drive, to reach the Pang Nga Bay Park Thai Restaurant, our longtail boat boarding point. Also, it is the chance to have a quick clean toilet stop, change into a swimsuit and apply sunscreen. With our day bags in tow, we make our way across a rickety jetty onto the wooden longtail boat. There is a slight waft of diesel before the boat picks up a bit of speed and we zoom along pale olive waters with Mangroves on one side of the tributary and limestone jungle cliffs to the other. Then we out into the open waters of Phang Nga Bay with so many islands on the horizon. Our first stop is James Bond Island a striking 20m/66ft tall limestone island reaching to the sky that you can’t actually get onto. Its official name is Ko Ta Pu but got the nickname James Bond Island as a result of the famous scenes from the movie “The Man with the Golden Gun” that were shot on the neighbouring island 40m/130ft away called Khao Phing Kan. Here we can climb through limestone open caves with stalactites and stalagmites. But it is the leaning rock wall caused by a seismic shift that is the stand out with its coloured striped wall of ruddy browns and charcoals showing how the water has washed down over thousands of years. But of course one cannot forget seeing James Bond Island. From James Bond Island our longboat makes its back up the bay towards a larger traditional Thai wooden boat. We disembark onto the larger boat, are fitted with life jackets and board small inflatable canoes that are paddled by a guide. Our canoe guide does a marvellous job paddling us from the Panyee Canoe Station over to the island of Ko Thalu Ok and navigating our way through narrow trails in the mangroves. Of course, the highlights are having to lay down in the canoe to gain access under very low lying tunnels to reach small grottos. Paddling back to the wooden boat we see HUGE boats preparing to take tourists for canoe rides. Our canoe paddler says that the Chinese tour groups turn up in the hundreds. He complained saying, “it was too much tourism for the area.” I hope this doesn’t turn into another situation like Phi Phi Islands where they have had to stop tourism altogether to preserve the natural habitat. Your bum does get a little wet during the canoe ride, best to wear a swimsuit (at least on the bottom half). Next up on our tour is Koh Panyee, a 200-year-old village that started with three families settling along the island of Koh Panyi (note different spelling). As the population has grown so too has the floating village. Now there are over 2000 local residents and they have included a decorative mosque and floating soccer pitch. The residents survive by fishing and making money through tourists. We start our Koh Panyee tour with a delightful lunch banquet overlooking the bay. The Thai lunch offers something for everyone, some dishes are spicy, some not and others perfect for the kids. After lunch, our guide directs us to wander through the village. Many of the homes have a storefront on the main boardwalk and their home at the back facing the water. Prices at the shopfronts are comparable to souvenir prices charged in Khao Lak or Phuket and the quality is fantastic. We finish our exploration of the village passing the ornate mosque and the famous floating Koh Panyee football pitch for soccer. Then it’s back to the longtail boat and make our way back to the bus. A short drive later, we stop at Wat Suwan Kuha (or Khuha) the Cave Temple. We are told that we will have an 80% chance of seeing monkeys. And we are not disappointed there are plenty of monkeys. I have to admit I was a little worried about the monkeys thinking they would be like those in Bali where they steal your glasses, purse etc. But no, they are not. Our guide advises not to make contact and especially not to feed the monkeys, then they will leave us alone. But it is inside the Cave Temple that I have come to see. It is important to remember when visiting Thailand’s temples that these are places of worship and not tourist attractions. Whilst the Thai people are happy for us to experience their culture they also expect us to respect it. Pack a sarong in your day trip bag so you don’t have to wear a used sarong. It is 20BHT to enter the cave (though this is included with our tour). You must be respectful covering shoulders to knees and everything in between. If your clothing doesn’t achieve this, then you will need a sarong. If you don’t have your own you can borrow one of theirs. Inside the cave are various Buddha statues. Some are small, others larger, some are gold and some grey. And then there is the large reclining gold Buddha. Further inside the cave, you can make your way down a flight and half of stairs to climb back up further into the cave. Back outside there is an ornate temple with monkeys everywhere. It is why Wat Suwan Kuha has been nick-named the monkey cave temple. After an hours drive, we are back to the outskirts of Khao Lak which has many waterfalls. We stop to see the Ton Pling Waterfall. We are in Khao Lak in April – the hottest month of the year and the end of the dry season so there is only a light trickle of water running down the granite rocks into a small pool of water. The water is cool and inviting and many take the opportunity to cool off before finishing a tour that offered so much more than just James Bond Island. 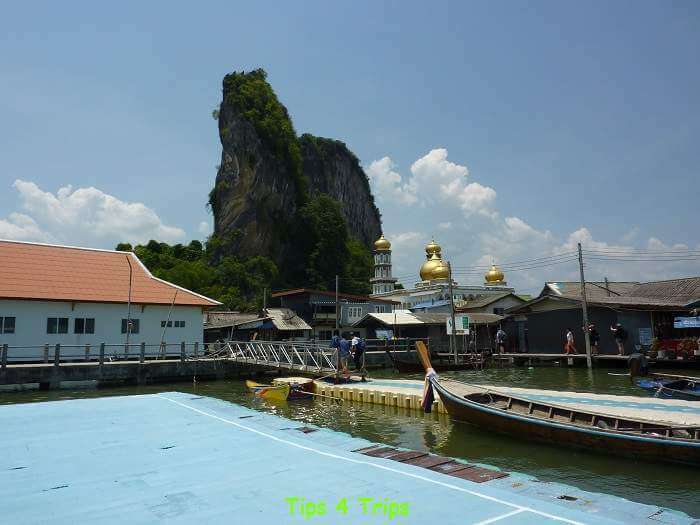 The main difference between taking James Bond Island tour from Khao Lak or Phuket will be how you reach the Phang Nga Bay islands. As Phuket is further away you will reach the province by speedboat. Whereas from Khao Lak you will get to travel to Phang Nga Bay by longtail boat, a traditional Thai wooden boat. Out longtail boat included life jackets for all. Phang Nga is one of 77 provinces in Thailand. The Phang Nga Bay is part of the Ao Phang Nga Bay National Park. To view the location of all the places we visited click HERE. Book all your tours through the same company to ensure you don’t double up on sites. There are other companies in Khao Lak town to also book a tour through or you could use Expedia* or Viator*. The tour price is paid in advance. You will also need some extra cash to provide tips for the canoe guide, longtail boat driver, main tour guide and bus driver. Additionally, you may like to purchase a photo of yourself on the canoe and souvenirs at Koh Panyee village. I would advise wearing the swimsuit under your clothes as there is little opportunity to change. Suitable shoes (walking rocky terrain and for being near water). All-terrain sandals like these would be perfect for men*, women* and kids*. Phang Nga Bay is located within the country of Thailand. Thailand uses the currency of Thai Baht. I would highly recommend that you exchange currency before departing on your day trip. There is VERY limited opportunity to withdraw or exchange money during the tour. There is a bank in Khao Lak town that offers fair rates. We stayed at these hotels. 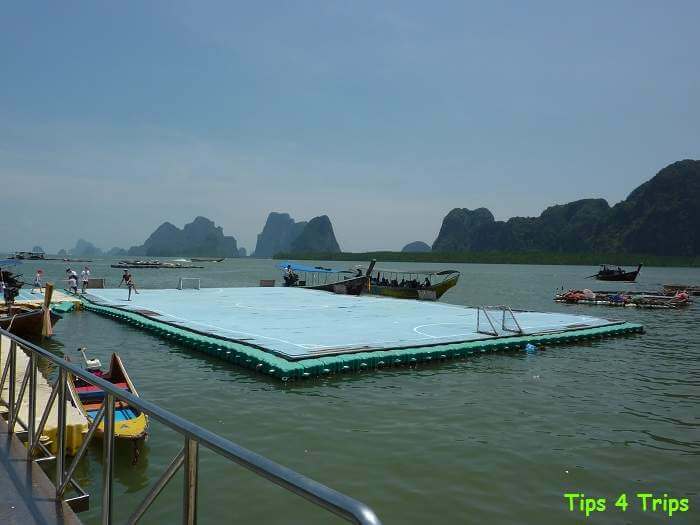 Both great places to base yourself for a Phang Nga Bay tour. This Thailand packing list for beaches and islands will have you covered for all situations you encounter during your trip. Why not get access to all our packing lists free to download edit and print over and over. Follow us on Facebook to learn when these are published. Just use the share buttons to the left.